As anyone who knows me personally will tell you, if there is something I like, I'll try to do it myself if it is reasonable. That would explain away a lot of this foodie nonsense that I keep posting. Last weekend while my friend from Key West was here, we made up an amazing Roast Beef with Port Wine Gravy meal. We took some of the leftovers and made up a very simple pastry dough and some Cornish Pasties were the result. 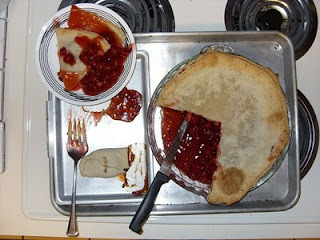 Quite good but I realized that I had to make my favorite Cherry Pie. You see the results. The crust started with Cream that was churned into Butter and Buttermilk, added salt and flour to the bowl, mixed it all together until it was like modeling clay and chilled. Had I not churned the butter, it would have taken all of 10 minutes so far, and I'm being generous. Making your own Pie Crusts are dead simple! Two hours in the refrigerator to allow it to harden enough to be workable, and the crust came out. I rolled it out until it was the right thickness, laid it out on the pie pan and formed it. I was not really going for beauty here, but taste. I got what I wanted. 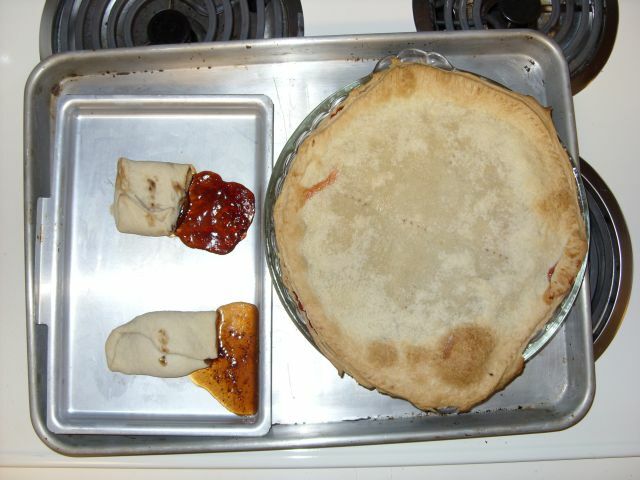 The pie and the two little leftover jelly stuffed things went into the oven and baked. Here is the result. I came to a few conclusions. Churned butter here was not necessary. Don't get me wrong, the crust was amazing, but you can't really taste the butter in this crust. Since you get about 2 cups of butter out of four quarts of Whipping Cream, you're basically paying $3 a pound for butter. Save that stuff for biscuits, cookies, and other baking where the butter taste shines through. Churned butter perfumed the house and made it out to the street with a smell that simply was amazing, but not really to the tongue. Next time I bake a pie like this, I'll remember to leave it in the oven just a little more. The center of the crust on top wasn't quite done to my standards and was just a little under done. My mistake but it still turned out great! I made some biscuits from the rest of the buttermilk and there are still some butter balls in the freezer. I can see I'm going to have to thaw some of that butter out and make cookie dough or bread... I'm floating in the stuff! The two little jelly tarts I made turned out interesting. They too could have done with a little more oven time, but they were fine. I have some Hurricane Jelly in the house. A big box of those jelly packets you get in pancake restaurants is in my kitchen and I wanted to use some of that up. I made one Grape and one Strawberry. The ooze that got onto the pan was an interesting treat, basically it was Fruit Rollups made out of cheap jelly. Not as good as the Cherry Pie, but worth doing. I'll do it again, but for now, I have 3/4 of a pie to eat in the next few days.